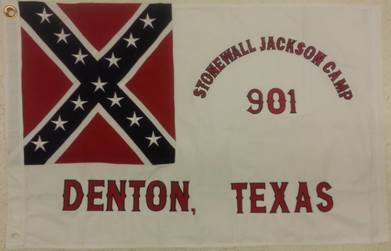 Welcome to the Stonewall Jackson Camp #901, Sons of Confederate Veteran, a registered Not-For-Profit organization. We believe Confederate heritage is a part of America's diversity which must be preserved. This includes educating the public with the facts surrounding the conflict as well as the ethnic and religious diversity that existed in the Confederate ranks. We defend the right of all Americans to express their pride, without harassment and discrimination, regarding their national origin including that which was derived from the former Confederate States of America. The Stonewall Jackson Camp works in conjunction with other historical groups such as the United Daughters of Confederacy, to preserve Confederate History. "Don't say it's impossible! Turn your command over to the next officer. If he can't do it, I'll find someone who can, even if I have to take him from the ranks." "My religious belief teaches me to feel as safe in battle as in bed. God has fixed the time of my death. I do not concern myself about that, but to always be ready, no matter when it may overtake me." Camp meetings are at the Luigi's Italian Restaurant located at 2000 W. University Drive, Denton Texas 76201. Feel free to arrive as earlier as 6:15. The camp meeting starts at 7 PM and falls on the second Tuesday of each month, except for December, when there is no meeting. All visitors are welcome at our meetings whether you are a member, non-member, or do not have a confederate ancestor.